To be more specific, I broke a couple parts of the dishwasher. I put a few too many heavy pots & pans in and the rack fell off it’s track. 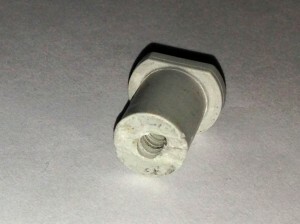 The rack rolls in and out on these little wheels, and the wheels roll on little axles, and all of those are made of plastic, and after several years of use the plastic becomes brittle and breaks. This had happened a few years ago as well and I’d been able to buy new parts, but from what I can find it’s not possible to just buy the parts these days. The replacement parts people are willing to sell a whole new rack, but for the price they’re asking I could just about buy a whole new dishwasher. This is not what I wanted to do. Fortunately for me, Scott Hanselman had just gotten himself into a new hobby about a month earlier, had written a blog post about it, and then had gotten together with others for a month-long project. If you’re following me on Twitter, you’ve likely seen a few posts tagged with #marchIsForMakers. You can learn more about this at http://marchisformakers.com/, but basically it’s a few folks encouraging us to get our hands busy with something other than typing — to actually build something and/or get our software interacting with the real world. So how does this help me? Well, I realized that I could design the part I needed, then print my own. There are a few steps and some learning involved there, but it’s not that difficult and it’s certainly a lot less expensive than buying new parts. It took me a few hours of tinkering around, similar to what Scott did here; it really wasn’t that difficult and it’s really pretty darn cool. By the way, I’m fortunate enough to work as part of a great team of developers who had already bought a Wanhao Duplicator 3D Printer. That’s probably not your case, but you may have more access to a 3D printer than you think. First of all, check with your more technical friends — they’re getting relatively inexpensive and people are buying them every day. If none of your friends have one, that’s not a problem. There are companies buying printers and selling time on them; jump over to Google or Bing and search for 3D Printing Services in [your city]. I encourage you to take a look at the March is for Makers site. Watch a few of the videos there, read some of the articles they’re pointing to, and get your hands on some hardware. 3D printing’s not that hard. There are microcontrolers and tiny computers that you can build into robots and sensors you can program to let you know what’s going on in your house. There are plenty of ways to get started without spending a fortune, and it’s fun.